There is creativity in all of us. Often it is buried due to criticism, expectations from others to have a more grown up appearance. Nevertheless it is always possible to work your way up and become creative again. There are several benefits that comes with being creative. You get to follow your dreams, brighten your life with new and interesting tasks, do things in a different way and also create a good impression. If you’ve been longing to become a creative person once again like you used to, read this article. The tips here are simple, effective and promise to help you in the future. So go ahead and discover yourself! 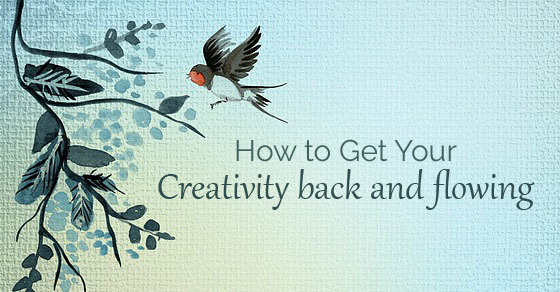 How to Get your Creativity Back? I have always made it a plan and a mission to spend one afternoon at least where I can completely be myself and stay unplugged. This sounds impossible in some ways but all of you can do it. In fact, if you want to become creative again, unplugging can help you in several ways. Keep away all mobile devices from you. There is no need for you to know who liked your pictures on instagram or who has been tweeting you. Get rid of all the texting, mailing, tweeting and facebooking. You should go outside, be alone and find inner peace and if you really want that to happen, then unplug yourself. Whether it comes to figuratively or even literally, the act of making something or doing something out of the box is always so powerful. I would definitely recommend it for those who are stuck in the same phase for a long period of time. You should do those things you havent done in a longer period of time. Whether it comes to taking a few pictures, doing some menial tasks, cleaning out your closet or catching up an old hobby, do all of it instead of doing your day to day errands. For me it is a fun thing when I am alone and I make coffee for myself and fill up my scrapbook with these cool pictures I clicked the other day. If you like art and craft, try a new DIY project. It will be just like recess. Another thing you can do to boost your creativity is speak to your friends and talk to them about it. If you have friends who give you real and inspiring advices, do it as well. Friends who understand you and want you to be happy will always be there for you. They will help you handle life and situation better and who knows? they could actually help you become better and creative people. People who are creative will always be able to inspire others, so make sure you meet those people who can help you do the same. There are so many people out there who are so habitual that they don’t think about breaking out of the monotony. They have the same old routine and it looks like they are quite comfortable with their sadness. Though routine is safe, at the same time it is also lethal. It could comfort you but at the same time it also restricts you. What you should do in cases like this is simply break out. There is no need for you to be so monotonous. You can simply shake things up a bit by trying new things. Explore yourself and see what you can do. You can spend a couple hours by testing a few stuff, or reading a good book. Do anything that will take your life in a new direction. It is quite easy to get stuck when you are in your daily routine. People often tend to lose their focus and ultimately they don’t remember the bigger picture. What you should always remember to do is stay focused. Motivate yourself by writing down all your goals in a piece of paper. Whenever you feel like life is too challenging and that it is bogging you down with changes, you should look back to your new goals. They will not only fix all your problems but also remind you why exactly do these problems have to be fixed. There are so many things in life that stress us so much. It steals our happiness, makes us tired and it ultimately leads to nothing. If you want to make yourself happy and free, I would definitely suggest you to throw everything away from your life that stresses you or makes you unhappy. If it is a bad relationship, bad friends or even a colleague at work who weighs you down, learn to say no to them! I do understand what many of you are thinking at this point. How can you be an inspiration to yourself? But before you jump into any conclusion, at least to what I have to tell. There are times when my mind cannot think. I cant understand what should I do to become big and successful. It is just too much for me. But when I visit all these beautiful places like museums and other natural wonders, I am immediately reminded that literally anything is possible in the world. There are times when I would visit the bridges in Brooklyn New York and would be absolutely shocked seeing all the beauty. I was awestruck and marvelled and it inspired me to do better. If you do the same, it will work for you too! The way you begin your day actually does matter because there is so much you make or break during the wee hours of down. Creative people are a little unkempt and smelly and we know that but if you want to start your morning in a fresh and better way then I would definitely suggest you to switch and change the way you start your morning. There will be times when you will give some creative moments. Plus there is so much to do in life apart from jumping into the shower and dressing up for work. Our point is to help you do things differently. I would also suggest you to become a more artistic as a person. Just drown yourself in the world of art and soak in an atmosphere that can help you play, learn and grow. You should experiment with different kinds of hobbies and activities. Some of them include writing, singing, music, dancing, making crafts, sculpting, drawing, painting etc. Art is known for cranking up your creativity. It helps you learn and discover yourself better. You never know what you can come up with after this! You should also catch up on sleep. A lot of people are not creative because they don’t sleep enough at night. If you are one of them, then I would personally suggest you to get some sleep regularly. Sleeping seven to eight hours daily is good for your health. It helps you lose weight, fights depression, clears your mind also boosts creativity. Even experts and researchers have to say the same thing. Getting good sleep will help you think better, open new doors and even let your imaginations run wild and I guess that is some of the things we have always wanted. Exercise is good for your body. Also experts have suggested that its needed for those people who want to get their creativity juices flowing once again. Around 30 minutes of exercise everyday will not only fill your soul with joy but also boost the dimension of cognition. It will get your blood flowing, allow your mind to get clearer and also let you have better thoughts. Those who exercise regularly actually have better thought processes than those who don’t. So make sure to add this to your lifestyle immediately. Of course you should have a lot of fun if that is your goal. Always remember to laugh and smile at others. Loosen yourself up and don’t be restrictive at all. We tend to forget how having fun is important for all of us. There are so many times we wrap ourselves in paying bills or writing good content or even when it comes to building better strategies. What we must all remember to do is enjoy ourselves. There are so many people who have accepted that going out and having a good time often helps them to think better. Engaging in fun activities makes them more creative people. There are several ways through which you can keep yourself motivated. One of them would be reading better books, watching good movies and inspiring yourself through these fun filled TED Talks. There are so many inspirational speeches on creativity available on the net. You should check them out when you have the time. We often need others to inspire us and if you don’t have anyone in front of you, I would definitely suggest you to check some awesome speakers online for help. Here are some ideas we think that will help you become more creative without having to step outside your home! Watch your children play: If you have kids at home or even dogs, let them play in your lawn and when they are doing that, watch them. You will feel calm. Enjoy how they are allowing themselves to fall into this whole rhythm of playing and are not worried about time or the rules or even the occasion. You should join them and allow yourself to go with the flow. Play with simple things: You should play with music, art, crayons, paint, your garden, horses, balls and whatever you can and would love to try. It should become a part of your daily life. It will also nourish and rekindle flames of creativity once again. Have better days: You should have better days or more importantly, better afternoons where you really don’t have much plans. Wander around, soak up and enjoy life. Whatever is thrown out to you, make something beautiful out of it. Take a close look at the things around you with wonder and let life just be. Laugh: Most importantly, remember to laugh. Laugh as much as you want to. Laugh loud and laugh deeply. Let your life be surrounded with laughter. Make it a part of your life. Here are some last minute tips that will help you. First of all, you should always let yourself to day dream. Secondly, you have to meet more people, socialize with those who are creative whether they are judgemental or not. You must always have an open mind to let creative ideas flow in. If you like, I would suggest you to volunteer or become a part of some organization. It will also help you discover yourself and get those creativity juices flowing. Never stop learning. In case you do, always have an open mind. Also remember that criticism is a part of life. It doesn’t define or shape you in any way. It is okay to be weird and strange as far as you know your crowd. With such ideas given above, I bet you can become a creative person soon. Those who have lost their creativity and would like to get it back can definitely get some help from this. On that note, good luck. Next articlePublic Relations Interview Questions – How to Answer Them?